Written on January 24, 2007, and categorized as Secret and Invisible. White stuff has descended causing spontaneous outbreaks of mirth among the inhabitants of London. This once common phenomenon known as “snow” is, due to climate change, now so rare as to cause the entire breakdown of normality and even cases of temporary insanity. 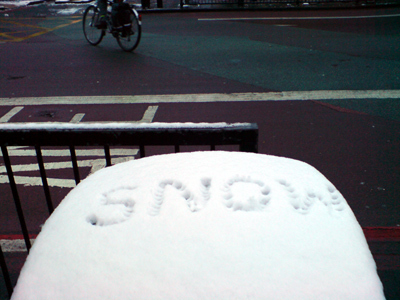 someday, i shall write S-N-O-W on real snow.